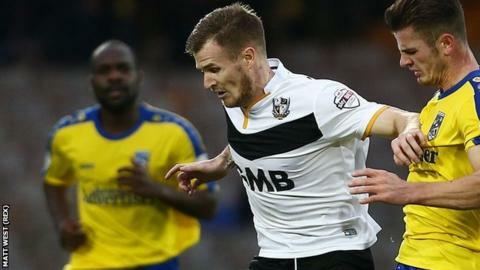 Port Vale midfielder Michael O'Connor says they must find a way of improving this season's away record before they take on non-league Maidenhead in next week's FA Cup first-round replay. Vale go this Saturday to struggling Barnsley, who were victims of a weekend cup shock, losing at Altrincham. And O'Connor is keen for Vale to get over their own near upset on Sunday, when they were held 1-1 by Maidenhead. "We want to put it to bed as quickly as possible," he told BBC Radio Stoke. "It will be difficult at Barnsley. but they're struggling at the moment and will be low in confidence." Since enjoying a first away win of the season in September at Fleetwood, Vale have since lost three successive games on their travels - an overall record of just two away victories in 14 matches dating back to March. "Our away performances have not been good enough this season," admits O'Connor, 28, making only his fourth appearance of the campaign on Sunday after missing the first two months with a knee injury. But Maidenhead's late equaliser, in the fourth minute of injury time, has handed Rob Page's side an extra away trip they could have done without. "Any manager would not have been happy with a 1-1 draw at home to a non-league club," added O'Connor. "It was their big day. They came and put up a good fight but we should have been out of sight. "I don't know whether it was complacency. Maybe some players thought we'll just put our boots on and go out and get the win. And it's now going to be 10 times harder away from home against a team like Maidenhead. They're not a bad little team and work hard for each other." Maidenhead manager Alan Devonshire, the former England midfielder who won the FA Cup with West Ham United in 1980, has already ramped up the pressure by accusing Vale of "letting themselves down in front of their own supporters". But O'Connor agreed: "We weren't sharp enough. Overall it was just not good enough, even if we'd hung on to win 1-0. But it's the FA Cup. Crewe got beat on Saturday and Barnsley lost at home to Altrincham. And the only good thing is that we're still in it." Vale's first round replay at York Road will be next Thursday (19 November, 19:45 GMT). Full match commentary on BBC Radio Stoke.